Is it too early to talk Halloween yet? Well with it fast approaching before you know, we thought it would be best to share some decorating ideas to incorporate into your own feast. 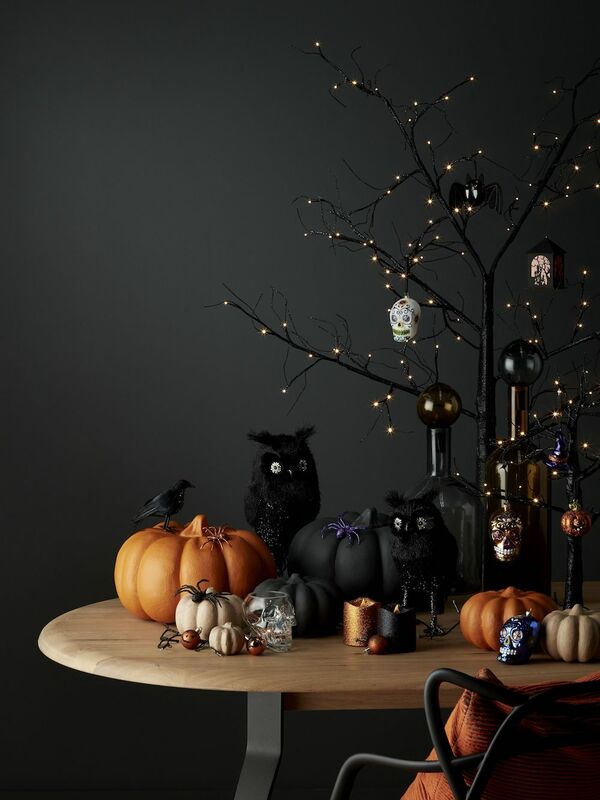 This Halloween host your own fright fest with these scary yet stylish decorations and accessories, available from John Lewis & Partners. From pumpkin trick-or-treat buckets and wreaths to skull glasses and hanging decorations, you’re sure to find everything you need for the spooktacular season. Selling a house can be a difficult task, especially if you have no prior experience of doing so. It often takes weeks, sometimes months to find the suitable buyer for the place that you have called home for many years. Many people opt to sell their home without involving an estate agent. If your asking the question of will selling my house fast through a website actually work, then It’s understandable. Cutting out the middleman often saves a lot of time and also possible fees of 2% to 3% commission that an online house buyer wouldn’t charge. Scroll down to read how you can sell your home quickly and easily without an estate agent. Direct House Buyer is a sure fire way of quickly selling your house. It allows homeowners all across the UK to sell their home at the fairest price. You can find them online and submit your property by filling out a form. They will arrange a visit to your house within the next 48 hours. Post-inspection, they make an accurate offer over the phone. Their team offers a variety of solutions from which you can choose the one that suits you the best! If you wish to sell your house within just a few days then Direct House Buyer can provide a cash sale which completes within a couple of weeks. Alternatively, if you have a bit more time on your hands then a exchange with a delayed completion could be a better alternative and allow you to receive a better lump sum at the end of the day. Since the owner has sentimental values attached to their home, it is common to set an unrealistically high price for your house. This obviously leads to a lack of interest from potential buyers. You can either contact a realtor to find out the appropriate value of your house or you can find an online pricing calculator to get an estimate of your home’s worth based on factors such as square footage, the number of bedrooms and bathrooms, and your home’s location. Gone are the days when people could sell their homes by putting up a “For Sale” signboard in their front yard. Today there are a number of options that can be employed to advertise your house. You can go for more traditional methods like putting up an ad in your local newspaper or you can register your house on a property selling website or app. The goal is the same with both the approaches; that is, to reach as many potential buyers as possible. Many sellers fail to realise that they have multiple options when it comes to hiring an estate agent. Most estate agents offer limited services that can help you with a particular aspect of selling your home. For example, you can get a market analysis done for your house without using a full-service agent. So, are you ready to sell that house? Nowadays, if you want a home lift, you do not need to be super rich and you do not need to make many compromises on space either. Home lifts are available to buy and install quickly and easily. They come in a range of styles and sizes with designs ranging from semi-transparent to a completely seamless, panoramic travel experience. In response to an increase in demand, a new, comparison-based website Home Lift Experts has launched to offer practical help and guidance to anyone making choices on the installation of a domestic lift. If you are considering how a home lift could work for you, the Home Lift Experts website covers off the most popular FAQs, pricing, sizing, detailed technical data and information on the installation process and after care. The new website currently offers comparisons on the top three UK home lift brands who are leading the march in terms of innovation and design. Whether you are working to a budget or money is not an issue, the Home Lift Experts team can advise on the best domestic lift solution for your lifestyle and personal requirements. For high performance, prestige and beauty, the Home Lift Experts website showcases the German-engineered Lifton Home Lift which, with its trend setting design and high-tech features, provides that extra bit of wow-factor. For advice on multi-floor lifts, Home Lift Experts go into detail on Artico Home Lifts - a Scandinavia domestic lift specialist with a range that can travel between two and six floors – perfect for townhouses. Home Lift Experts explains how best to take advantage of these flexible lift systems which can be fully customised all the way down to the floors, the doors and the walls. The third home lifts specialist which is explored in fine detail is Stiltz Home Lifts. This business is responsible for the explosion of interest in home lifts in the UK as it was the first to introduce the stilts-based, self-supporting compact home lift on easy glide rails, designed specifically for home use. Elegant and affordable, the Stiltz Home Lift is light years away from the boxy, bulky, hospital-type lifts which were previously only available to homeowners. Design and innovation go hand in hand with eight different models to choose from, including a thru-car option for maximum convenience and maneuverability. If there is anything you want to speak to a home lifts professional about, Home Lift Experts also has a customer care centre with advisors who can help you work through your options. Once you have made your choice, they will even provide you with a central contact at one vendor who will take you through from installation to completion. How are you coping with the hot weather lovely readers? Lately Britain has experienced some of the highest temperatures for more than 100 years; with the whole nation on heatwave alert and experiencing temperatures in excess of 30 degrees. We're just not used to it are we? Whilst a whole host of advice is available to mere mortals on how to cope in the heat, your flowers will suffer too. With this in mind tech-first florists Bloom & Wild have prepared five easy tips to keep flowers fresh this week and for the rest of the Summer. Place stems in tepid or lukewarm water as they will enjoy this more and absorb the water more quickly than cold, keeping your flowers hydrated! In this heat, trim 5cm from the base of the stem to remove any blockages and creating a new permeable drinking area. Don't forget to always cut at an angle to increase the surface area. Bacteria breeds within dirty vases, and the heat welcomes this breeding! Make sure you clean your vases really thoroughly with anti-bacterial wash to sterilise them. Don’t leave any leaves or bits in your water, only perfectly trimmed stems. Bits of greenery and leaves will rot in the water, especially in the heat and breed bacteria that will shorten the life of your flowers. Keep flowers as cool as possible. Changes in temperature can make blooms die quicker, i.e. a room with sun that moves around the room can have a negative effect. The sun also evaporates the water in your blooms and stems, so keep them out of direct sunlight. Choose a wider neck vase than the width of the flowers, which allows air around the stems and prevents mould building. Always happy to support British designed and made, Heart Home talks to John Darling, founder of Darlings of Chelsea to find out more about his company and what exactly he means by the 'Darling detail'. What inspired you to start Darlings of Chelsea? I have always been interested in business and was on the lookout for something to get involved in when I ordered some leather sofas from a well-known sofa retailer. The sofas took 16 weeks to arrive; came from China and were damaged when they finally did arrive. I had a very difficult time with customer service and the whole process was a bit of a nightmare. It got me thinking that there must be an easier way to buy a sofa and so I decided to start a company selling British made sofas, with a huge focus on customer service. I need a new sofa bed for when guests come to stay. Where do I start and how much should I spend? The age old saying 'Buy cheap, buy twice' is something that definitely applies to sofa beds! Most customers we speak to are coming to us for their second sofa bed, as they went cheap on their first one. We always advise our customers to be wary of cheap sofa beds on the market. By the very nature of a sofa bed, it needs to be robust enough to cope with the action of setting it up and sleeping on it, as well as comfortable enough to serve as a sofa. This is not an easy balance for manufacturers to achieve, especially not at a cheap price point. We would recommend paying anything from £1100 up for a sofa bed that is going to last. Make sure that your sofa bed has a solid wood frame and always check out the mattress before buying. Can you talk me through the process from paper to product? We are constantly assessing our ranges to see what we are missing, or to try to keep up with developing trends. We often take inspiration from many areas such as furniture shows, interiors magazine and Pinterest. We then come up with a design ourselves based on what we know our customer wants. It doesn't matter how nice a new design looks though- it's all about comfort, so we end up testing many prototypes until we are happy with the comfort, depth, proportions etc. We always consider the Darling Detail too- what little features make this piece stand out from others on the market? Once the finished product is ready, we make it in a fabric or leather that we know will photograph well and try to choose a photo location where that product looks at home in. Once the shots are ready, it goes online and in store. We often feature new products in email newsletters and on our social media accounts too. With a vast collection of sofas and fabrics, how do you choose which designs to modernise and create new ranges for? We have really learned to listen to our customers on this one and to act upon their feedback. We have amended ranges in the past to ensure they are more comfortable, or deeper or changed the legs to keep up with trends. Occasionally, we realise some detail is putting people off an otherwise amazing sofa- if you just change the legs, then suddenly appeals to people all over again! Saying this though, I think it's important to note that we don't chase every single trend. We are confident that we have timeless sofas in our range that never need to be touched. We want our sofas to last you for years without going out of style and think it's sometimes better to modernise your accessories or cushions instead. What is your favourite Darlings of Chelsea design? There are so many to choose from but I think one that sticks out in my mind is the Darwin - and not just because it's one of our bestsellers! We love it for its clean lines and neat appearance, but at the same time it is incredibly comfortable. It holds in shape so even though you sink into it, as soon as you get up it looks impeccable. The contrast piping along its cushions adds that Darling Detail and really makes it stand out from the crowd- we always encourage our customers to get contrast piping on this sofa! It's also incredibly versatile depending on what fabric you order it in. There's a dark velvet chaise version of in our Surrey showroom which looks seriously luxurious, decadent and almost feminine; while there is a grey sofa version of it in our Fulham showroom which looks so fresh and really nods to the mid-century modern trend. We have just ordered a Darwin snuggler chair for our own house which we can't wait to see! I think it changes all the time depending on your surroundings or stage of life. We lived in Switzerland for 6months when we had a pop up shop in Verbier and our style then was quite rustic Scandinavian, which obviously complemented the surroundings and lifestyle there. We now live in a Victorian house in London now though and there are a lot of mid-century influences as well as some luxurious velvets. But since starting a family, our style is changing and we are beginning to lean more towards larger, comfier sofas accessorised with lots of cosy textiles and a softer look in general. The age old debate! This is such a tricky one. I would always have said fabric as you can have such fun with different textures and colours. There is something wonderful about unwrapping a new fabric sofa and seeing how the velvet looks in the light, or how perfect a linen chesterfield looks- they are often works of art. However, since starting a family, we can now totally appreciate why people prefer leather. It is so durable and there is a lot to be said for being able to wipe it clean! I think you can soften a leather look with carefully chosen blankets and cushions, giving you the best of both worlds. Alternatively you can always choose a stain resistant fabric too! I think a mix of both throughout your home is a good balance. What's the best practice for choosing a sofa? Choosing a new sofa can be so much fun and a really exciting experience. It's important to remember there is a practical side to it too though. Make sure you have measured up before you visit the store- this way our staff are much better equipped to help you. Measure the space where you want your sofa to go, as well as all doorways or hall spaces that it will need to pass through. Our staff are really helpful and experienced and lots of them have interior design qualifications too, so bringing a photo of your room is a recommended as they might be able to make suggestions. Be open minded- try lots of different sofas and not just the one you think you want. You would be surprised at how many of our customers leave having bought a totally different sofa to the one they came in for! You don't have to visit a store to buy your sofa, many of customers buy online without ever visiting a showroom. They rely heavily on great reviews about comfort, as well as the confidence they take from our awards for customer service. Take advantage of ordering free swatch samples on line and examine them in the room they will be in- in daylight, electric light and side lighting. Fabrics and leathers can look totally different from one room to the next. We are currently trying to update our leather range. We have noticed a trend for fixed cushions on leather sofas and thick natural leathers so we would like to update our ranges to include this element. We are also hoping to improve our offering of upholstered items such as benches, stools. The most exciting thing though is finally launching a sofa bed that has a mattress as comfortable as a normal bed – it’s called Alexi and is in most of our shops now. What colours and patterns do you see trending next? Shades of yellow velvets are becoming increasingly popular. Statement mid-century velvet chairs in mustard and turmeric shades are in demand. We have also noticed a huge increase in free swatch sample requests for olive green velvets. Larger products are still purchased in more neutral shades, but often with a statement chair to complement them, often in an eye catching velvet or linen. Super soft high quality leathers are also in more demand than ever. People are really averse to their leather sofa to look shiny, a more matt appearance is much preferred these days. Leading the way in design and functionality, premium home lift company Lifton is rapidly becoming the heartbeat of any modern home. Highly specced and minimalist, the curved car with its soft, grey finish, looks stunning and instantly futureproofs any home allowing homeowners to continue to live in the family home they love. With a Lifton domestic lift, there is no need to move to a bungalow or retirement apartment or to build a downstairs bedroom extension. Providing access to all areas, the Lifton Home Lift is designed to be the centre of attraction. Its compact footprint and semi-transparent finish blends effortlessly with its surroundings. Homeowners are attracted to its unique architecture, simplicity and style with the knowledge that it can be fully installed and functioning in one day, causing minimal disruption to a project or plan. It can also be used to transport luggage, laundry, even grandchildren safely and efficiently between floors. As an investment purchase, a Lifton Home Lift offers a prestige alternative to a standard hydraulic home lift or a cumbersome stairlift. It can provide a return on investment by adding value to the home. Operating within its own self-supporting structure, the Lifton Home Lift, manufactured by the Stiltz Group, who also offer home wheelchair lifts, is quite unlike any other residential lift on the market. When the lift is stationery upstairs it virtually ‘disappears’ leaving only two slim stilts remaining on the lower floor. When the Lifton is located downstairs, a small section of upper level flooring, fixed to the lid of the lift, ensures that any flooring upstairs flows as normal. The Lifton Home Lift quite literally can integrate into the home overnight and its ‘easy-glide’ rails, built-in drive technology and mains powered operation, ensure that when in motion it is very quiet. In fact, Lifton owners say they barely know it is running. The Lifton Home Lift is designed to fit in with the user’s lifestyle and mold to its surroundings and for this reason every homeowner is able to customise several elements of their chosen lift. This includes the option of bespoke colours and finishes. Lifton is the lift that becomes part of the home. Kitting out your guestrooms with new hotel duvets is a substantial investment. Fortunately, it’s not something that you should have to do too regularly – as a general rule, your duvets should last around 10 years. But if you don’t maintain them properly, you will need to change them more often. So it’s important that you look after your hotel duvets to ensure that they stay in optimum condition for many years to come. Protecting your duvets from spills and stains, duvet protectors are essential for keeping your hotel duvets looking clean, hygienic, and in good condition. And it’s not just about keeping things looking clean and tidy, duvet protectors will also help to prevent dust mites from getting into your duvets and causing problems for guests with allergies. There are plenty of affordable, high quality duvet protectors on the market, including this one, which fastens with a zipper to ensure that the duvet doesn’t come out. If you change the duvets in your guestrooms seasonally, then it’s important that you store your duvets properly when not in use to ensure that they don’t collect dust or become damp. Make sure you store your duvets somewhere dry with good air circulation, such as a linen cupboard, as this will prevent them from becoming damp. If you frequently store duvets for long periods, you should consider investing in high quality storage bags that will help to protect your duvets from environmental factors that can cause long-term damage. When you bring your duvets out of storage, ensure that you air them in order to keep them feeling and smelling fresh. To air your duvets, hang them outside on a washing line on a mild day before giving them a good shake to revive the filling and plump them back up. It is important to air your duvets regularly to keep them feeling clan and fresh. Although it’s understandable that, when you do wash your duvets, you’ll want to get them back in action as quickly as possible, it’s important that you don’t rush the drying process. If your duvets aren’t totally dry when you put them back on the beds, this could cause the build up of mildew, causing them to smell stale and damp. As a general rule, you should tumble dry your duvets on a medium heat for around 4 hours. Natural duvets can take a little longer to dry out than synthetic ones so double check they are totally dry before putting them back on your beds. When washing your duvets, make sure that you never use any harsh detergents of fabric softeners as they will leave a residue, which can damage the duvet’s filling. Instead, opt for mild detergents and put your duvet on an extra rinse to ensure that any residue is fully washed out. Your duvets are a key part of your guests’ experience, so it’s important that you keep them clean, comfortable, and hygienic. Following these simple tips will help you to keep your duvets fresher and functional for longer. Let me tell you a story about Meghan. She’s had the same, comfortable home for the past ten years. Since coming into its luxury, Meghan’s life has flourished: marriage, kids, and joining a community. Every day after a hard day’s work, Meghan comes home and reclines on her couch surrounded by ornaments her and her family have collected over the years. Every day it’s the same song and dance, with its own ups and downs, positives and negatives. This place that Meghan calls home, that you spend your personal time in, that your family shares in, is starting to feel odd—a sense of monotony is beginning to bubble. After all this time of the same routine, Meghan wants something to break the norm and add zeal to this space she’s called home for so long. That’s where the Oriental carpets of Fine Rug Collection come into play. Your household is the place to express who “you” are. It’s your home; it’s your space; it’s an extension of you. From posters, to portraits, to furniture, to the very colour of your walls, the aesthetic choices at your disposal have always been your choice. Like these prevalent choices, an Oriental rug is no different, offering you that same level of customisation you’ve always published in your home. No matter what room, an Oriental rug is the perfect addition for any Interior Designer, amateur or professional. The options at your disposal are comprehensive for a specific reason: each Oriental rug is handcrafted knot by knot from wool, cotton, or silk. From the weaving to the dyeing process, no part of an Oriental rug is either machine-made or manufactured. The product you end up with is authentic in every single aspect, built on a history and craft that have endured for several centuries. This overall process allows for no two Oriental rugs to ever look the same—even rugs that belong to the same category. With these products, your choices are thorough, giving your home the potential for a profound presentation. Are you seeking something to synergize with your light tan walls? An Oushak Oriental rug, with its flavorful floral designs and muted colours can do that. Are you pursuing that extra zest for your bedroom to give it a savory touchup? A Heriz Oriental rug adorned in medallions, geometric patterns, and a blend of dyes such as red, beige, and blue can do that. Do you want something to give your dining room that finishing touch, but you’re unsure just what it could be? A Kashan emblazoned with centerpiece medallion, floral brush, hard borders and varied dyes can do that. The flexibility when it comes to an Oriental rug are genuine and extensive. Our company, Fine Rug Collection, is here to help you along every step of the way. We understand the ins-and-outs of Interior Design; we respect your time and interest; we want to put the best possible product in your hands. There’s no comparable feeling to the first time you set foot on a soft, handcrafted Oriental rug, and we want to bring that luxury to you in any way possible. Winter is creeping up on us and Christmas is only around the corner, and I bet your thinking, what is the easiest way to tie the two cold, snowy settings together? So what is your idea? Because I think I may have the perfect suggestion for you! How about an exclusive, luxurious, comforting wool rug? Just imagine yourself snuggled up on an all natural, pleasurable textured wool rug, placed in front of a roaring fire, feeling the heat of the flames stroke your face, sipping a tasty hot chocolate and watching your favourite programme on the telly. Whilst your feet are sinking into the comforting warm and cosy feel. I know I can’t think of a better and more relaxing way to spend my chilly winter nights, how about you? Bring the outdoors in during this cold frosty season to create a cosy abode. Wool rugs are 100% natural products that will compose warmth and extreme comfort to your floors, whilst also delivering tons of style. A classy, fashionable rug looks perfect on every flooring and can look incredibly stylish placed neatly in front of a dazzling fire place; but don’t you worry, wool is flame resistant! I know we all like to keep a close eye on the kiddies whilst they’re being mischievous and playing, but you also want to spend a bit of you time, isn’t that right? Well, owning a wool rug can solve you this never ending problem. Delivering absolutely irresistible comfort due to soft and natural fibres your kids can’t say no to playing on a beautiful wool rug meaning you don’t have to tire yourself out chasing the cheeky monkeys about you can kick back and relax whilst being able to keep that close eye on them. Hang on though, now you’re concerned about the rug getting mucky aren’t you? Not a chance! Wool rugs are dirt and dust resilient; in fact, they can hold up to 1 pound of dirt per every square foot before even slightly appearing dirty. Damage is your next worry right? Not to worry! Wool rugs are incredibly durable resulting in an immensely long lasting product for your homes. I recently purchased my very own beautiful wool rug after spending hours of browsing on www.therugshopuk.co.uk . After viewing all the different styles, colours, patterns and sizes of all the wool rugs on this impressive site I couldn’t resist ordering one for myself. The Imperial was the one I fell in love with and by using the discount code WR10 I received an amazing 10% off on top of a sale price!! The service I received was outstanding, ‘FREE & FAST UK Delivery’ is the exact words they stated, and without fail my rug came well within the promised delivery time! I am absolutely in love with me rug! I just can’t wait to get home from a long, hard and tiring day of work to get all snuggled up on my new wool rug with a red hot cuppa, plenty of goodies and just relax. I can’t resist the immense pleasurable feel of the soft shagginess of the rug in between my toes and the sensational sinking feeling you receive. Wow! A wool rug is a definite must have this winter! On those hot summer nights, trying to keep cool as a cucumber is no easy task. Of course, there are a lot of great tricks that you can implement, like putting your sheets in the freezer, taking a cold water bottle to bed, or getting creative with fans. However, there are a few ways that your bed itself – or how you choose to adorn it – can play into keeping you cool. Stay away from silk and polyester sheets, and go for cotton. Not only do good cotton sheets feel more lightweight, but they promote better ventilation, will feel more breathable, and absorb moisture – like sweat – all aspects which will keep your body cooler. Although you aren’t likely go out and buy a new mattress just because it’s summer, you should keep the season in mind when you do need to replace your mattress (which should be every 10 years). When you invest in a mattress that is incredibly comfortable and designed for good airflow, like this one is, you are investing in something that will help you achieve a great night’s sleep all year round. As with any type of purchase like this, be sure to read reviews before buying to hear about other peoples’ experiences first. This blog also goes into great detail with regards to the unboxing and initial thoughts of the mattress. Give a buckwheat hull pillow a chance. Trust us, this is actually a lot cosier than it sounds. Aside from giving great support, buckwheat hull pillows promote good air circulation and absorb sweat and moisture, unlike a cotton or down-filled pillow. Both of these characteristics will keep you a great deal cooler on those hot and balmy evenings. There are many places where you can buy these online, or you can actually make it yourself if you are feeling up to the challenge. When it comes to creating a warm, welcoming, and comfortable experience that your guests will never forget - as the saying goes - the devil really is in the detail. This means understanding the importance of finer details and evaluating what it is that your guests really want. One area that you should absolutely never compromise on is the quality of your textiles, namely the bed linen, bedding, towels, and, of course, pillows – after all, they are key to a perfect night’s sleep. Of course, not everyone’s idea of comfort is the same, especially when it comes to hotel pillows. Where one guest might prefer a firm pillow for comfort, others may opt for softer options. And then there is the material to consider. Some guests may prefer the feeling of synthetic fillings whereas others want to use natural materials. With such contrasting preferences you may wonder how to ensure each and every guest who passes through your establishment will have a good night’s sleep. The answer is a pillow menu! Creating a pillow menu is a sure fired way to set you apart from the crowd and give your B&B a luxurious, unforgettable twist. Hotel supplies are often categorised for convenience in the UK, making it a popular listing method guests are growing accustomed to. First things first, it’s always a good idea to start off with a brief description of each pillow on your menu. The description only needs to be clear and should include all of the key information about each pillow, such as the filling type, the fabric of the cover, and the type of support the pillow provides. To make the menu attractive and user friendly, why not include images of each pillow to help your guests decide which kind they would like to try? As well as the descriptions and information on the menu, the actual layout is just as important, and it’s essential to keep your pillow menu simple, straightforward and easy to read. Why not divide your menu into sections such as soft or firm, natural or fibre? This categorisation is ideal for helping guests quickly and easily find what they are looking for. Another approach is to use icons to indicate the features of each pillow – for example, you could have a hypoallergenic icon to indicate the pillow is suitable for visitors with allergies. Using icons can also help guests effortlessly see how soft or firm a pillow is. The differing levels of pillow comfort are widely considered by industry professionals. To ensure that your pillow menu is useful, effective, and memorable, it’s important to offer guests a variety of options when they make their pillow choice. Remember it’s all about making sure that your guests have plenty of options at their disposal to find the perfect pillow. That means including everything from goose feather and down pillow types, to siliconized polyester and Tencel filled pillows. Make sure there is something for everyone! Oh, and you should always ensure your staff are familiar with each pillow on the menu and can comfortably handle any enquiry your guests might have. By following these handy tips, each and every one of your guests will hopefully enjoy a wonderful nights’ sleep, tailored to their needs. Getting a good nights sleep during the summer months can sometimes be a bit of a problem. Our body clocks seem to adjust to the daylight hours no matter what we do, and no matter how late we stay up, sleep is elusive. If you regularly toss and turn all night at this time of year, maybe you need a few tips to help you rest well and wake up feeling refreshed. 1. Go to bed at your usual time. You may feel that by staying up you will get more tired, but actually you just get a second wind. It's best to stick to your usual routine. 2. Make sure your room conditions are conducive to sleep. In summer that may mean using a fan or simply opening the window. A blackout blind may also help to block light and fool you body into sleep. Earplugs (pesky birds never seem to sleep during the summer) and an eyemask might also work for you. 3. Invest in a summer duvet. A 4.5 tog duvet should be enough for this time of year. If you are too hot in bed you will not get the quality of sleep that you need. And it's worth noting that a duvet filling plays a major role in determining warmth and vice versa; so a 4.5 tog down duvet will be significantly warmer than a 4.5 tog microfibre duvet. 4. Develop a bedtime routine. For some this may mean a cool bath or shower. Others may prefer to take a herbal tea to bed and read for a short while. The important thing is, to do the same thing at the same time every night so that your body anticipates sleep. This is your chance to take the opportunity for a little 'me' time too. Fill the bath with bubbles and invest in some fluffy towels. Or play some relaxing music while you unwind. 5. Avoid any stimulents late at night. Don't have coffee or sugar for several hours before bedtime and it's also best not to eat that late too. 6. Don't use the computer for at least three hours before you go to bed either. Or for that matter, any other bright lights such as TV, phone screens or overhead lights. Hopefully by following just one or two of these tips you quality of sleep will improve and you will be more ready to face the day each morning. The shell of a duvet should be a high enough thread count to prevent noisy crunching. The softer the shell, the lighter and more breathable the duvet will be. The construction of a duvet should be baffle box (not channels) to prevent clumping and cold spots. The best quality pillows are filled with white goose down or a blend of down and feather. Soft: A good choice for stomach sleepers. Look for a pure white goose down pillow. Medium: Preferred by back sleepers. Choose a pure white goose down pillow with extra fill. Firm: Ideal for side sleepers. Look for a feather and down blend. The more feathers, the firmer it will be. This post was written in collaboration with My Pillow and Duvet, a family business that offers you some of the finest duvets, pillows and bedding products available, and all at the best price. I’ve always thought that using a mirror in a small or large space is one of the best ways bring in some more natural light. Now that the days are getting longer and sunnier I thought it would be the perfect time to share with you my top 3 suggestions and some lovely mirrors that are around this season and how they can help boost your interiors. Designer does come with a price tag, but it is so worth it for the visual impact as well as the fact that high quality designer mirrors are built to last and last. They are designed to last a lifetime so think of it as a quality investment. My first suggestion when selecting a designer piece: if you often change your mind about interiors then buy a classic silhouette. Gubi takes mid-century design and adds Scandinavian twists to its collection and the Adnet mirror is a beautiful example of this. The design with its classic lines and refined, minimalistic style oozes elegance and sophistication. It can be attached to the wall for a more formal look or simply lent against for a casual and laid back feel, giving you the freedom to change it up if you like. Its smooth frame has been delicately covered in leather, which really emphasises the quality when you see it in a room. This piece could lend itself to a traditional or contemporary interior with ease. Secondly, instead of statement wallpaper or an overdone wall full of framed pictures, try a mirror that combines beauty, interest and function. The Cube mirror by Malabar features 7 geometrically designed mirrors that cascade together to form one large piece. This mirror is more like a work of art than a looking glass and its that extra factor that makes this a must have piece if you are looking for something large and a bit different for your wall space. I love the completely unique idea and layout behind this mirror; it is a real talking piece that still retains classic lines and flawless simplicity. Finally, multipurpose is key especially in a small space or family home, and, if you can find a clever new piece that delivers this, then it is really worth considering it for your home. Opinion Ciatti have got this covered with their ingenious Bel Vedere Bookcase, available from The Longest Stay, which doubles up as a full-length mirror. This piece is versatile and would work wonderfully in a bedroom, the surrounding shelves filled with make up or jewellery. Equally, it would look great in a living room as somewhere to keep your books and toys whilst still lifting your space with exquisite, natural light. With houseplants experiencing a surge of popularity in today's interiors, the designers at Elho have used the principles of retro plant display and vintage design, with contemporary manufacturing finish and colour, to create a fresh new iconic design. The stylish pod design can accommodate plants up to 9cm and is available in white, anthracite, chalk yellow, vintage blue and magical green. While the stylish and adjustable cord allows for suspension variables between 50 and 100cm. Dramatic when hung as a trio and equally beautiful as an individual feature, we think we could find a few places around the home for a Elho planter or two. A selection of herbs in the kitchen window maybe? Or a moisture loving specimen in the bathroom. Much nicer than the macramé slings of the 1970's made from rope or gaudy yarn! The B.for Soft Air planter retails at £8.95 and is available from Elho. To prove it and to help you along, we’ve put some top tips together for helping you both maintain a long distance friendship! There are countless sites and applications that can help you stay in touch with friends and loved ones at the touch of a few buttons on your phone or computer. There’s a whole world outside of the most popular options of Facebook and emails, such as Skype, Whatsapp and FaceTime. Therefore there are ideal options for when you’re at home, at work and when you’re out and about on the move. Of course, nothing will really beat seeing each other in person. Though it might not be practical or even possible to see each other fairly frequently, you could aim to meet each other a few times a year. You could alternate going to each other’s houses, or if you’re really far from each other, you could meet in the middle too. When you’re not around someone for a while, it can be easy to put them towards the back of your priorities. However, you’ll need to work harder to keep a long distance friendship alive and well maintained. Therefore it’s a good idea to schedule some time in, even if it’s just a quick call every couple of days, or sending a quick email on your lunch break at work, for example. As well as using all of the technology at your disposal, why not take the old fashioned approach and put pen to paper? Receiving something through the post that isn’t a bill is always nice, too! Sending a letter to someone is a really great way of showing you care, as it takes a bit more time and effort. Likewise, sending your best friend a little gift (no matter how little) through the post now and again is a really sweet way of showing you care, and showing that they’re still an important part of your life. It’s a great way to keep things like personal jokes going, too! A key trend for 2016 is black and white or monochrome interiors. Harvey Maria, the fabulous flooring experts have found that more customers are opting for statement patterns and looks with their Neisha Crosland Parquet tile in Charcoal being a best seller. When it comes to choosing colour for the home, there is an enduring appeal about a chic monochromatic colour scheme. Whether you choose a muted grey toned look or opt for a bold black and white contrast, it remains timeless yet design led and gives the perfect canvas to add subtle pops of colour. Black floors are perfect for adding drama to your interior. If your room has great natural light, opt for dark flooring and then contrast with light coloured furniture or embrace the moodier hue and choose luxe texture and fabrics. Alternatively in an all white interior such as a bathroom or kitchen and opt for the Neisha CroslandParquet in Charcoal for a statement floor. If you want embrace the monochrome colour scheme but not as dramatic as black floors, choose tones of grey – these looks equally good when paired with pastel walls. When used in a pattern such as the Neisha Crosland in Stone or Sage or the new Dee Hardwicke Lattice in Pebble it can still make a statement but in a more subtle way. Use in conjunction with the new Little Bricks, in complementary colours to create borders or zoning within the room.